Whilst in Amsterdam, for the launch of the Dutch version of his book 'A Verdade da Mentira', Gonçalo Amaral took time out to answer some questions. Q: Have you considered the possibility that Madeleine died on the previous night or even when Mrs. Fenn heard the crying? A: Naturally - the investigation begins with establishing if the person who disappeared, does actually exist and then, who was the last person to see her - the investigation shows clearly that she was last seen around 17.30. 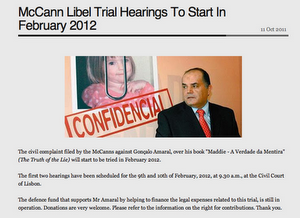 Q: Have you any doubt as to the validity of Madeleine attending the creche on 3/5? Q. Do you think the case will definitely be opened soon? A: We would like it to be reopened, in fact I wrote my book to prevent the shelving of the case, but it did not work out that way, the book actually came out one week after the case was shelved. The counterforces were very strong. In the political climate of today, there is a movement leaning towards the reopening of the case. Q: What is the most efficient way for us to help you? A: To let it be known there is a certain pressure, from the pubic opinion. Q: So it is useful, then, to write to the Prosecutor? A: Yes, and also to the Justice Minister and Members of Parliament. Q: Did the content of the 14 text messages have any relevance to the case? A: No. But what IS relevant is that they deleted calls from their mobile phones. 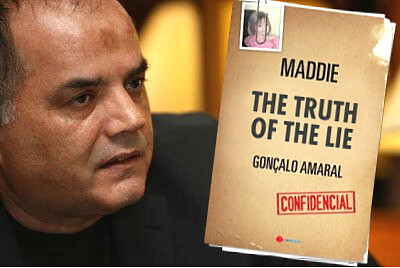 Q: If the McCanns had been honest about Madeleine having died in an accidental manner, what would have been the juridical consequences in Portugal? A: Almost none. A mild punishment for neglect. That is provided the body did not show signs of violence. In England, as in Germany, punishment for neglect of children is more severe. Q: Do you think the McCanns knew that? A: They have made a decision very fast. It is well possible they did not know about the law in Portugal, but not that they did not know the law in England. Q: Are you hoping the McCanns will sue you? A: Yes! (here he gave a Portugese metaphor about a bullfight, something about having to first entice the bull into the middle of the ring before the fight can start). Q: Is it true, as was reported in De Telegraaf, that an injection needle was found in the apartment? A: No, that is not true. In fact we have found no medication at all. None at all. Except for 'likdoornpleisters' = litt. : corn plasters (for your feet - sorry can't find a better translation). Q: Do you think the children were sedated? Q: What do you think is the meaning of the blood behind the sofa? A: Possibly from an attempt at resuscitation. Q: At what time do you think the death has occured, given the fact that cadaver odour needs time to develop? A: Cadaver odour begins to develop at the moment of death, due to chemical reactions in the body, it is not a matter of hours before it develops, to the nose of a dog which is very sensitive it can be detected very soon. More important is that from the inquiry we know that before the 3rd of May nobody died in the apartment, nor in the car. Q: There was a story in a newspaper that the dogs followed a trace to the beach, is that true? A: No. Mark Harrison had made a schedule, a plan, for the dogs, where they should search. They have searched all the apartments, the villa, the cars, the church, the sewer pipes near the church, the beach, fields, but the only traces the dogs found were in the apartments and the car of the McCanns, some clothes, and the soft toy. Q: Do you think the body was refrigerated? A: Yes. The bodily fluid in the car show that. If the body had been buried there would have been mummification. The fact that there were fluids points to refrigeration. Q: Where do you think the body was kept? A: That is what we were trying to understand when I left the investigation. 15 alleles might not have been conclusive in the eyes of the Public Prosecutor, but for the investigation it was sufficient. The body must have been in the boot of the car. We want to know who drove the car, who was behind the wheel. Q: Do you know if Gerry is a FreeMason? A: Police does not investigate such things. It can be he is, but I don't think it is of significance to the case. Q: When Justine McGuinness left she did not want to speak to the Portugese press, why not, do you think? A: In her diary, Kate speaks very badly about Justine. Q: Do you think Justine knew something was not right? A: I rather think that money was the problem. Q: The Daily Express mentions that Madeleine's body could be in the tunnels. What do you think? A: These tunnels have been investigated, we would have known. Last year an English lady also pointed them out.